Also there is a movie about Sri Kumaré. There is also a facebook page for the Kumare movie, along with a twitter for @SriKumare. The Kumaré Method, often called Adarsha Yoga or Mirror Yoga, is a method of personal transformation that includes a regiment of yoga asanas, pranayama, kriyas, metaphysics, philosophical discourse, and nada, all infused with Adarsha or a deep meditative reflection. The Sanskrit word "Adarsha" has been translated by scholars as "the Ideal", "Mirror", and even as "the Non-Vision." The Kumaré Method is an accelerated path to happiness, and enables each person to embody her own Adarsha, ideal reflection. The physical practice of the Kumaré Method most resembles 'vinyasa' or flowing yoga, already familiar to yogis in the West. The regiment is infused with breathing and chanting techniques, often used in Kundalini Yoga, designed to enhance prana (life force) and Uae (transformative energy) within the practitioner. Sri Kumaré is usually assisted by a U.S.-certified yoga teacher. The non-dualist philosophy of the Kumaré lineage, like its sister faiths Hinduism, Buddhism, and Jainism, works as a guide for understanding and overcoming Maya (Illusion). The Kumaré tradition, though, teaches that one must embrace Maya in order to Unveil it. Sri Kumaré believes that transformation is only achieved through a combination of Reflection and Action. His philosophy is simple and effective, his stories exciting and poetic. 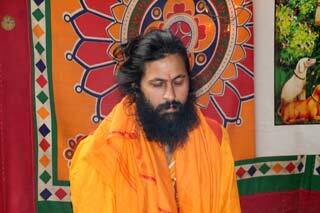 Sri Kumaré's teachings are as relevant here in the US as they are in the Himalayas. The Kumaré lineage embraces the eternal sound, Uae. Uae, a mantra and expansive force of the universe, has been referred to in the founding sutras of the Kumaré lineage. Mirror Yoga harnesses this force of Uae to affect accelerated change in serious practitioners. The essence of Mirror Yoga can be deeply felt during the practice of dhyana or meditation. Sri Kumaré's distinctive guided meditation brings students face to face with their Adarsha, the ideal reflection within them, and their Inner Kumaré, the divine child within us all. In the tradition of the great Himalayan masters, Sri Kumaré is known for his ability to transfer shakti (spiritual power) to students open to receive it. Shaktipat is a spiritual transference that is applied via the ajna chakra, or tilak. Copyright 2010 www.kumare.org. All Rights Reserved.